Wood floors are great for so many reasons. Some homeowners like the convenience of easy cleaning, while others feel like it adds a luxurious feeling to their home. Some with allergies prefer wood floors over carpet as hardwood floors do not collect and hold dust particles like carpet does. Hardwood floors can last a lifetime, but care does have to be taken to ensure the life of them. Just like with your car needing oil changes, brakes and other services, hardwood floors have their own maintenance that is required. No matter what your reason for choosing professionally installed hardwood flooring here is some information you should know. Dry, arid climates characteristic of a midwest winter can often result in ‘dry-cupping’ in wood floors. From late fall until early spring the relative humidity drops significantly which can cause problems for wood floors. Due to this humidity difference, the top of the board dries quicker than the bottom of the board, especially when this layer (the wear layer) is extremely thin. This imbalance causes the upper layers to pull away from the wood that is rooted firmly into the subfloor, which is much more stable. This can display through cupping or lifted corners, as well as through cracks, wrinkles, splits (openings all the way through the depth of the board), checks (openings that don’t span the entire length of the board), and wrinkles or ruptures in the finish. The cupping is not usually the fault of the wood, it is the environment to blame. Purchasing a higher quality of wood flooring can lessen the chance of cupping as well. Ideally, wood is healthiest between 68 and 72 degrees Fahrenheit. However, as long as humidity levels are constant, regardless of if they are on the higher or lower side, the floor will be impacted less than with constantly fluctuating humidity levels. Most of these cups, gaps, and cracks will likely disappear in spring when humidity and temperatures rise and floors return to their fully moisturized state. Running a humidifier can also help the moisture levels and your floors will love you for it. One of the great things about working with Musolf’s Wood Flooring is we are here to help guide you with the right kind of flooring for the right area. For over 60 years, Lon Musolf has been a well-recognized name. 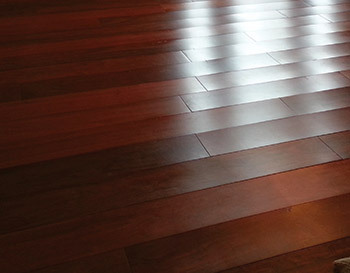 Our knowledge of wood flooring is considered an industry leader. Our Twin Cities based showrooms are open 7am-4pm Monday through Friday, by appointment. Phone calls are welcomed and personal visits are encouraged to assist in the hardwood flooring decision-making process. If you are not already working with a Musolf’s account holder we can provide qualified referrals upon request. Please keep in mind Musolf’s personnel cannot address questions that pertain to price, only our account holders can help you with that.